Several days a week, I have a huge salad and something else for lunch. Today I wasn’t sure what the “something else” should be, so I threw together this quick rice noodle dish. It has a bit of a zip thanks to the raw ginger and red pepper flakes. I used wide rice noodles, but you can use whatever you have on hand, from spaghetti to vermicelli. 1) Cook rice noodles according to package directions. Drain, rinse under cold water, and set aside. 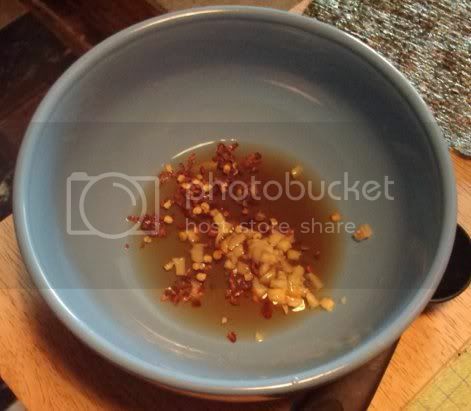 2) In a small bowl, mix together the soy sauce, rice vinegar, ginger, and red pepper flakes. Add the noodles and toss to combine. 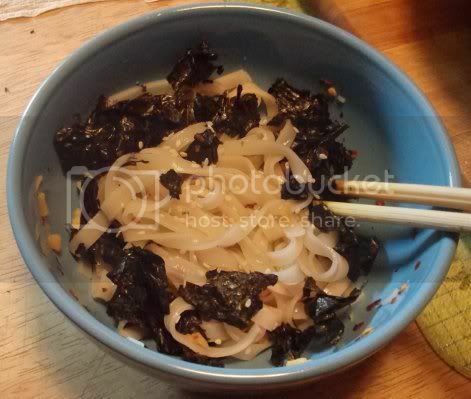 3) Sprinkle the nori over everything and garnish wish sesame seeds, if desired. If you have time, you can chill it a bit for a cold noodle salad.